There are at least 250 million kids that can't read or count even if they have spent four years in school. The United Nations plans to address this through Education First, a call to action by UN Secretary-General Ban Ki-moon. The initiative, comprised of three priority areas-put every child in school; improve the quality of learning and foster global citizenship, is in response to the statistics surrounding school access and learning internationally. Education First will bridge the last three years of the Millennium Development Goals adopted in 2000 and will help shape the new education goals following 2015. Click here to learn more information about Education First and its three priorities. Click here to read David Archer's, Head of Program Development at ActionAid and GCE Global Board Member, blog on Education First. Simply Equal Education is a nonprofit organization that works to help young people in the United States understand their role as active agents of social change and to help them develop relationships with their peers around the world. Founded in 2008, by Amanda Malamut and Caitlin McGee after spending a semester in Equatorial Guinea, West Africa, the organization both connects students around the world through the commonality of education and provides school supplies and fees for students and schools in need in Equatorial Guinea. 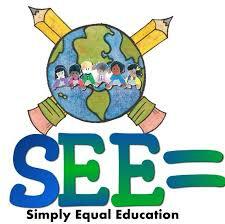 Click here to find out more information about Simply Equal Education. The American Federation of Teachers, along with TES Connect, the largest network of teachers in the world, have created Share My Lesson-a web destination for teachers to collaborate across cities, states, countries and continents-only limited by how far the internet will take them. The resource was created for teachers by teachers and is a free platform that teachers can use to "collaborate with, encourage and inspire each other." Click here to visit Share My Lesson and to get involved. Action Alerts are produced and distributed by the Global Campaign for Education-US, a coalition organization dedicated to ensuring quality education for all children.